Our Fifth Anniversary Month continues with our SECOND GIVEAWAY. Entries for this giveaway are being accepted ONLY on our Facebook page. Our history and story of the first five years of The Pink Slipper Project continues. In 2010, I joined AC4C (All Crafts 4 Charity) on Yahoo. The "List Mom" of AC4C prepares an annual calendar with one or two charities listed per month. I contacted her and asked if The Pink Slipper Project could be on the 2011 calendar. PSP was added and, in the spirit of AC4C, their members responded with over 400 pairs of slippers (PSP wasn't doing washcloths then). Everything was sent to Joyce and she sent them to shelters. Once each year since then, the members of AC4C have sent hundreds of pairs of slippers to us. There have been many shelters that received not only slippers, but everything that AC4C sent us, including hats, toys, baby hats, baby sweaters, scarves, and baby blankets. Several weeks ago, I took a trunk load of AC4C goodies to a shelter near me. They were delighted with what I had brought and wanted everything! During the last few years, we also received washcloths and lots of soap. I still have a great many slippers, washcloths, hats and baby clothes that will be distributed in the next few months. On August 18, 2011, PSP celebrated its’ 2nd birthday and, by September, had 2,300 friends. It was during 2011 that Joyce had her first spinal surgery. The Pink Slipper Project Signature Knit Slipper was published in 2010. Revisiting the 2011 Facebook posts has been like a trip down memory lane. Joyce loved to put up pictures of all the slippers that arrived in her studio. I’ve seen the pictures and read the names of so many people. There are members who joined early and are still participating in our challenges or are still following our journey. Joyce posted a lot of challenges during 2011. She “visited” Iowa, held a local Stitch-A-Thon with a group in New Orleans, “visited” the Hope Coalition in Red Wing, MN, and, in conjunction with the Compassion Fashion Project, warmed toes and hearts in seven shelters in Arkansas with our slippers! In February, 2011, Joyce posted her “Hospital Doll”. The pattern for the cloth doll is here on the blog. The Pink Slipper Signature Crochet Slipper designed by Judy Warehime was published in March, 2011. In April of that year, the “Knit Teddy Bear”, designed by our friend, Carol Levesque, made its debut. Carol’s teddy has warmed so many hearts and made many friends as they were distributed to the children in our shelters. Carol has given this pattern to Pink Slipper and it is also listed on our blog. You will notice that from time to time I refer to the shelters that have received slippers from us as “our shelters”. We send our love and, I believe, a piece of ourselves via our handmade slippers and washcloths…..and so, we call the shelters “ours”. Next Monday, the story continues. Stay tuned. GIVEAWAY - WEEK ONE - UPDATE - NEW WINNER! The deadline passed and the winner for the first giveaway of Anniversary Month did not contact us. Therefore, we had to pick a new winner. Peggy contacted us right away and her prize will be on its way to her on Tuesday. Information on our next giveaway will be posted on our Facebook page (only) on Monday, August 11, 2014. Hope you will come join in! CONGRATULATIONS, NANCY! You have until 6:00 PM (EST) on Saturday, August 9, 2014, to contact us by Facebook message or by email at thepinkslipperproject@gmail.com. We will need your mailing address in order to ship out your goodies! The next giveaway in our Anniversary Celebration will be listed the beginning of next week.......so please check back in often! (1) The deadline for entering our first 5th Anniversary Giveaway is 10:00 PM (EST) TONIGHT (August 7, 2014). Check out our post and picture below for all of the goodies included. Remember, you can now enter by sending us a Facebook Message with the words, "GIVEAWAY WEEK ONE" and include your email address or by signing into the Guest Book here on the blog with the same information! The mailing deadline for this challenge is September 3rd, I hope you will consider making a pledge now if you already haven't done so. Please put your pledge in a comment box in the post with the challenge information. Thanks!! The Christine Ann Domestic Abuse Services originally opened in 1984 with 13 beds. By 1991 they moved to their current location and dedicated the 35 bed shelter in memory of Christine Ann Clark who had been murdered by her husband while her baby slept just yards away. Through their emergency Help Line, they have responded to 11,000 emergency calls and requests for information. The Christine Ann Center now serves Winnebago and Green Lake Counties in Wisconsin. 5 teen girls - DONE! 5 preteen girls - DONE! 5 preteen boys - DONE! 5 youth girls - DONE! 5 youth boys - DONE! 5 toddler girls - DONE! 5 toddler boys - DONE! 5 infants – gender neutral colors - DONE! As always, this Challenge is being run on our Facebook page as well. Numbers still needed will be updated here as quickly as possible. If you wish to take part in this challenge, please put your pledge in a comment below and we will receive it. Thank you. WHEN A CATEGORY HAS BEEN FULLY PLEDGED, IT WILL BE MARKED "DONE". WE'RE CELEBRATING - IT'S GIVEAWAY TIME! Now that Rachel has told you about our founder, Joyce Lucas, and the beginnings of The Pink Slipper Project, it is time to kick off our Fifth Anniversary Month with our FIRST GIVEAWAY! 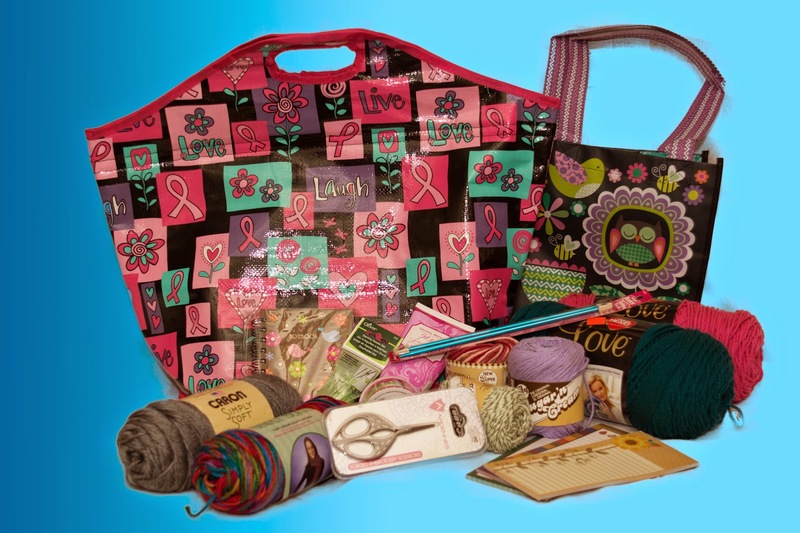 As you can see in the picture, our first giveaway package is a Large Breast Cancer Awareness insulated tote full of all kinds of goodies that we hope the winner will enjoy! It contains another small tote (perfect for small takealong projects), two skeins of Red Heart With Love yarn, 2 skeins of Caron Simply Soft yarn, 3 skeins of Sugar‘n Cream cotton yarn, one pair of Susan Bates Size 8 knitting needles, two Susan Bates Lucite crochet hooks (not pictured), a Chibi (case with metal yarn needles), a pair of Ardennes small embroidery scissors (perfect for carrying in your purse), three magnetic note pads, a small notebook, a roll of ribbon (4 patterns), and a tube of “Wild Jasmine” hand lotion…with an approximate total retail value of more than $50. Now for the little nitty-gritty details on how to enter to win this bag of goodies! You will have until 11:59 pm (EST) on Wednesday, August 6, 2014, to enter this giveaway. We will draw a winner on Thursday morning (8/7) and announce the winner both here and on our blog. We will also send an email to the winner (so be sure to check your Junk mail folder just in case). The winner will have until 5:00 pm (EST) on Saturday, August 9, 2014, to contact us or another winner will be drawn. As part of our 5th Anniversary celebration, each Monday there will be an ongoing journey from August 18, 2009 to Today. You'll learn more about the history of the past 5 years. As we've made a journey to many states around the country as we 'visited' shelters, you'll make the journey with us starting right now. During the entire month of August, the Pink Slipper Project will be celebrating its 5-YEAR ANNIVERSARY with a little bit of history each week, new challenges, and weekly giveaways. The Pink Slipper Project was founded on August 18, 2009, by Joyce Lucas of Virginia. She was inspired by Terry Grahl of Enchanted Makeovers, who was using her generous spirit and talents as an interior designer to perform makeovers at domestic abuse/homeless shelters for women and children. With the help of volunteers from all across the country, these shelters were madeover to feel more like “home” with many handmade personal touches. 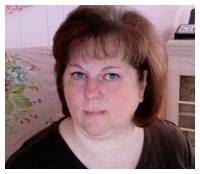 If you are not familiar with Enchanted Makeovers, we hope that you will check out the website to see pictures of some of her “transformations”. At the time of forming the PSP, Joyce had her own online web businesses. She was both a Web designer, creating website designs for women’s online businesses, and running an online shopping site where women could list their shops (in a very “pink” environment) and have their businesses marketed to the public with special sales, etc. At the start of PSP, many of Joyce’s clients joined in on this new venture. On August 24, 2009, Joyce published her pattern for the “Signature Sewn Pink Slipper” and she was off and running! If you look in the Photos section, you will see many pictures of slippers made using her pattern. Within one week of starting PSP, there had been a request from Newhouse Shelter in Missouri and 125 pairs of wonderful handmade slippers came pouring into Joyce’s office to be unpacked, photographed, individually bagged and tagged, and shipped off to the shelter! What a wonderful beginning! As Joyce had a challenge for Newhouse on August 24, 2009, we will again have a challenge for them on August 24, 2014. Within one month on Facebook, the Pink Slipper Project had 500 friends. In August, 2010, the Pink Slipper Project was featured in The Weekly Newsletter published by the Lion Brand Yarn Company. This was quite a compliment for the then-year-old PSP. The e-newsletter was sent out in the late afternoon. Joyce and I (Rachel) were at our computers waiting for visitors to arrive….and arrive they did by the thousands. There was a steady stream of visitors from late afternoon and on into the evening as the e-newsletter was received across several time zones and around the world. Joyce and I greeted every person who liked the PSP for hours. By 1 a.m., things had slowed down and I went to bed; Joyce later told me that she was up until 3 a.m.
By August 14, 2010, the PSP had 1,800 friends, a gain of about 250 from the publicity received through the Lion Brand newsletter. We were just one year old and had already received national attention by a major yarn company! There will be more of our history coming in the next few weeks. We hope that you will enjoy hearing about our beginnings and where we are now. We have more new challenges coming up this month, including a few “specials”, and a GIVEAWAY each week ….. so we hope that you will stay tuned and join in on all of the activities we have planned! Congratulations, Terry Grahl, of Enchanted Makeovers!